This simple timer clock provides basic functions to record the elapsed time. If Java is unavailable on your platform, select 'Load Script' in the navigation menu above to display an alternative compatible version of the application. 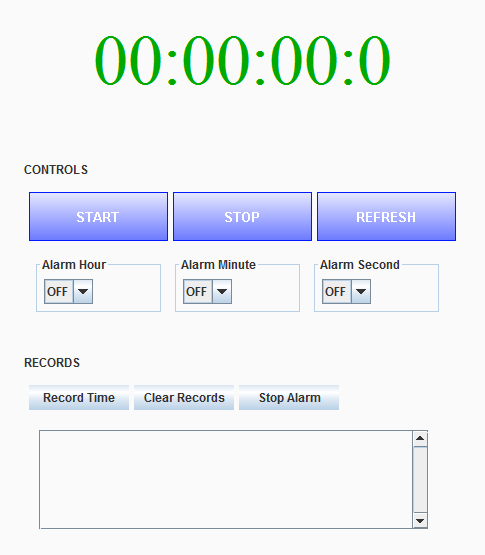 The timer or stopwatch can be started, paused, refreshed and an alarm time can be set. Note that if any of the alarm settings are selected to 'OFF', the alarm will not be set. You can additionally sample the elapsed time and add these records to the provided display. The timer will stop counting and the text will change colour to red once the alarm time has been reached. The alarm can also be terminated by refreshing the display. A timer can be used practically for any purpose that requires the measure of speed and agility. They can be used in sport as a measure of improvement in performance, or for exam practice to improve time management skills.